OK! So what was supposed to be a 10 day trip back to Sydney, was extended thanks to Sandy the superstorm. We're now back in NYC, with power and hot-water. This recipe however, is for Mu, she's living with eight (yes that's eight) girls in Utrecht and was desperate for some quick, cheap and easy dinner ideas. Looking through my past dinners, I realised almost all of them were done post-work, & post grocery shop. 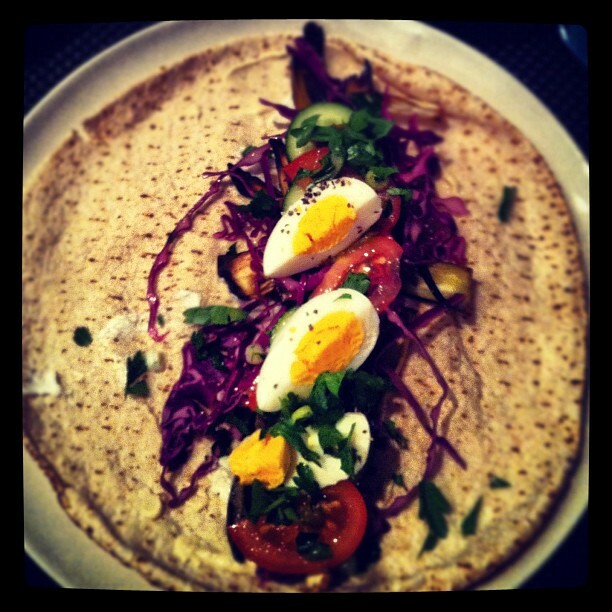 So without further blabbing - I give you my Sabich recipe. Well maybe a little more blabber, to give the origin. One theory is Sabich comes from the Arabic word "sabach", which means morning, as the ingredients are typical of a Middle Eastern breakfast. 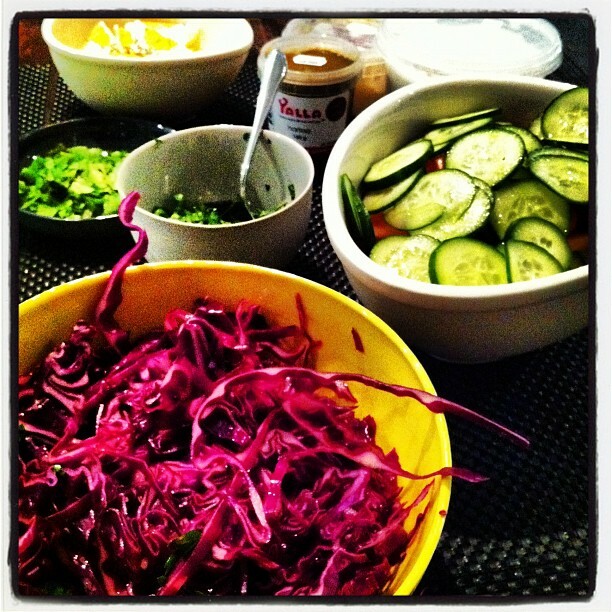 The other is that it's an acronym in Hebrew Salad (סלט), Egg (ביצה), More Eggplant (יותר חציל). Whatever the origin - it's delish and a great option for dinner - not to mention HEALTHY! Pre-heat the oven to 220 degrees, fan forced. Place the eggplant on a line baking tray. Drizzle the olive oil over the eggplant, it doesn't have to completely cover the slice, just a little will do. Sprinkle over the spices & place in the oven for 30-40 minutes, depending on your oven and the size of the eggplant. Take them out when they are a little dark around the edges, but still a little soft in the middle. Cut up the veggies while the eggplant is in the oven. Put the cabbage, vinegar and sugar in a medium size pot. Cook on a medium-low heat for 5-10 minutes. When the cabbage is slightly opaque it's ready. Place a slice of Lebanese bread on your plate. Spread out a spoon (or two) full of hummus length-ways down the middle of the bread. Add a teaspoon of Harrisa if you like an extra kick of spice. Grab the grilled eggplant and place a 4 or 5 pieces, running length-ways on top of the hummus. Repeat with the cabbage, pickles, tomatoes, cucumber, egg, & parlsey - you can use as much or little as you like, but remember it has to roll up. To ensure the wrap seals, add some extra hummus in the middle. Fold up the bottom & close in the two sides. PRESENTATION: If you're having people over, serve up the ingredients in different bowls. People can help themselves to what they like. Also, I have to thank my brother-in-law, who introduced us to the Sabich in Israel, was the perfect pre-flight snack. Won't lie,I am no Martha Stewart,and could easily screw up this recipe if I attempted it,but it looks super delish.